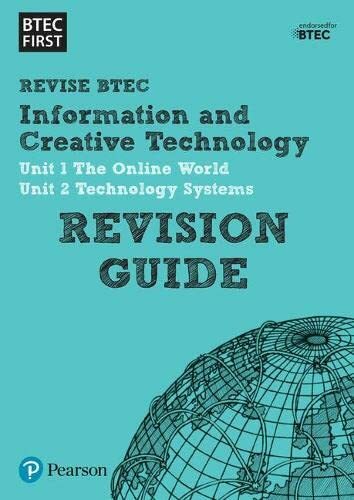 Special offer - get any BTEC First in Information and Creative Technology Revision Guide or Workbook for the school/college price of just GBP2.49 a copy (RRP GBP5.99) - simply use code 16REVCC at the checkout when ordering online*. Ideal for classroom or independent study, this Revision Guide is the smart choice for learners studying for the externally assessed units of the 2012 BTEC First in Information and Creative Technology. The one topic-per-page format provides hassle-free revision for learners with no lengthy set-up time and no complex revision concepts. Written with learners in mind - in an informal voice that talks directly to them. Visually engaging pages break the content down into easily-digestible points, with revision activities and worked examples that prepare learners for the test. Designed to be used alongside the BTEC First in Information and Creative Technology Revision Workbook with one-to-one page correspondence to make it easy to use the books together. Covers both externally assessed Units for 2012 BTEC First in Information and Creative Technology (Units 1 and 2).